As the year ends and the new year begins, I think ahead to what our “focus” will be for the new year. 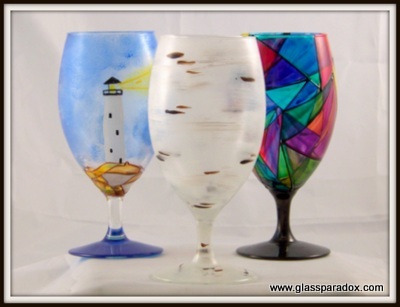 Last year was the 25th anniversary of glass painting for me. My focus was to celebrate the milestone by offering twelve different 25th Anniversary Balloons at $25 per pair. I accomplished the goal and remained focused. The year began with the New England Made wholesale show in Portland in March. Where we introduced beverage glasses and Maine Woods, added a couple retailers - My Darling Maine in Bar Harbor ME and Wild Goose Country Store in Sunapee, NH - to the wholesale family. I showed off the new items to a few of my longtime retailers - My Wine-y Sister in York Beach and Maxwell’s Pottery in Old Port, Portland. NEM is a small regional show, heavily promoted by Maine Made with a family-like atmosphere. Fun but not overly profitable. We also attended the Finger Lakes Wine Festival having another great event, even with sales being cash only on Saturday due to connectivity issues. Glass Paradox hasn’t been cash only in over 15 years! As usual, we stayed at Echoes of the Glen, dined at our favorite local establishments, and enjoyed spending time with David’s cousins from PA.
Fall was our busiest season. We were open at the studio on Maine Craft Weekend in October. We chose not to participate in the UMC Bangor craft fair in November, where we have been off and on for several years. Once again, coordinated and participated in the Penquis Valley craft & vendor fair at the high school where I teach. Wesley and his fiancee’ were here for the weekend and helped with set-up and managed the Glass Paradox booth for us. I would not have survived the weekend without them and David helping! December continued to prove busy! We participated in the John Bapst craft fair for the first time, a juried event which was a very enjoyable and profitable choice. It’s a well organized juried event. And, our annual Holiday Open House at the Glass Paradox studio is in December. With these two events and website orders coming in right up ‘til Christmas week, we were busy. 2019 is going to be a little different. My focus will be the Glass Paradox website. With David’s help, I am planning to build the online catalog to include ALL of the current designs in all of the glass styles. 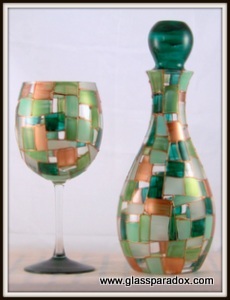 I would also like to add a section of handcrafted items that are wine related to coordinate with your Glass Paradox artware. I’ve decided not to participate in NEM, which means my wholesale marketing will be focused solely through IndieME.com, a juried online handcrafted wholesale site which I have been a member of for several years with varying success. And direct mailings to Glass Paradox’s current retailers. Well, we will not be participating in the Finger Lakes WIne Festival, Wesley is getting married the same weekend! We will be participating in the York Days craft fair in August in York Beach Maine. York Beach was the place my family always vacationed to when I was growing up so, this will be fun! And of course, in the fall we’ll have our annual Holiday Open House on the 2nd Saturday in December, just after the John Bapst craft fair on the 1st Saturday of the same month. November, is not yet scheduled. We’ll be having another Penquis Valley craft fair but, I’ve been considering moving it to October, Maine Craft Weekend, so as not to compete with winter sports and other Thanksgiving activities. And, we may do the UMC show in Bangor again...time will tell. But, the focus will be on www.glassparadox.com! Watch for changes, increased designs and styles and monthly specials!